It’s a book about video games… so there are a lot of pictures right? Nope, it’s basically a case study disguised as a fairly entertaining and extremely informational book. 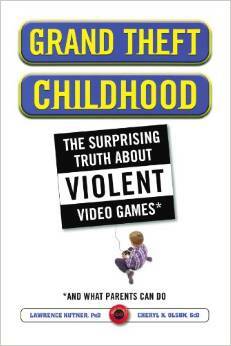 Husband and wife team Lawrence Kutner and Cheryl Olson use a popular game title in Grand Theft Childhood: The Surprising Truth About Violent Video Games and What Parents Can Do to make it more marketable, but the social issues and media history addressed cover the issue of video game violence very well. The study, including some 1,300 middle-school gamers in Pennsylvania and South Carolina, may seem somewhat limited, but you still get a good sense of the behind-the-scenes issues within the studies like girl‘s surprising interest in the Grand Theft Auto (GTA) game series. The authors point out creative aspects and a gamer’s background before playing the GTA game that makes this issue more than just good and bad while explaining how entertainment and creative expression through the game would appeal to several girl gamers. The authors also stress an important and perhaps forgotten aspect of the violence debate – how exposure to real violence in the household factors into game play. There are plenty of cross referencing among chapters, which increases the reading difficulty factor a bit. Grand Theft Childhood also gives plenty of pro-active parental advice and hints on informational assistance to promote direct communication bridging the gap between why the game are played and how they related to real world issues. Parents and caregivers can pick out this advice in easy bulleted segments, mainly near the end of the book, but audiences will more likely to see this title in college level psychology, sociology or media related course than a leisurely book club, especially with virtually no graphics or pictures. You get a basic understanding of how to measure evidence plus tons of media snapshots of influential games (Watch Out Behind You Hunter, Border Patrol, etc.) and other groundbreaking media, which many audience have not experienced yet (dime novels, The Great Train Robbery film and Castle of Otranto book). Further inquiries about different experiences in different media widen the scope, and mind, even more, then the author hones in on specific video games with useful questions, such as asking if there is such a thing as good violence, which provokes some serious thought. Kutner and Olson want the reader to be well-informed, so they provide a rich scope of relevant subjects, including how games are rated by the Entertainment Software Rating Board (ESRB) in chapter 7 while including international counterparts like the Computer Entertainment Rating Organization in Japan. Gaming addictions (page 157), physical exercise and social marketing (chapter 6) also add to the variety of interest. This dynamic duo, who founded the Harvard Medical School Center for Mental Health and Media, even add some legal interest, especially a case in Illinois. The authors definitely pull no punches in this area, even calling experts who gave testimony demonstrating the detrimental effects of violent video games purveyors of “junk science.” In addition, the authors even encourage pundits to “relax” while referring to media in earlier ages that supposedly would collapse society, but never did. After more than 270 pages and 15 pages of end notes, this book’s academic study approach gives you a better understanding of the big picture in video game violence. Specific study examples (protective older siblings shielding their younger sibs from violent media), values promoted in violent games and how these games relate to a child’s true beliefs, all enforce a great theme of keeping parents involved and informed about violent video games. So many people have witnessed or experienced a parent or caregiver who lets the child talk them into buying violent video games at stores then returning them when they actually witness the game’s violence… well, if they‘re proactive enough to actually watch the children play the game. Kutner and Olson’s work puts the responsibility back on the parent/caregiver while debunking violent video game myths and exposing even more. It’s a great proactive book which can even trigger some helpful media research where the parent/caregiver might even revisit their own experiences relating to violent media. Grand Theft Childhood constitutes an insightful title for parents and other childcare givers looking for informational assistance on violent video games. This entry was posted in Book Reviews and tagged Book, Michael Siebenaler, Mike Siebenaler, Tall Writer, video games. Bookmark the permalink.